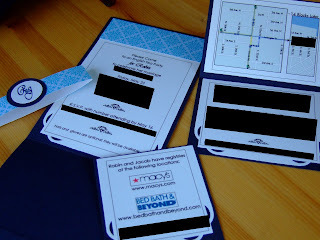 Unicorns are people, too...: Moving on to Invitations! My husband's cousin is getting married next month, and her mother so kindly asked me if I would like to make her bridal shower invites. "Of course!" I cried delightfully. That's my thing. My favorite part of making stuff has always been designing. I made several sketches, and finally came up with what I thought would work. I actually went through several sketches before I came up with my final design, but here it is. She wanted 27 invites so I thought it would be cool to divide them into 3s and make 9 each of three different paper designs as you can see. Oh, and don't mind the black spots all over the place. I have to protect the innocent and all that jazz. You get the idea. This is the main part of the invite. 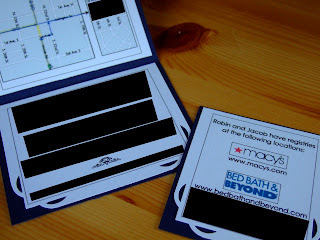 It also comes with a folded map and a registry card tucked into a pocket in the bottom. Here's a close-up of the two enclosed cards. Again, don't mind the little black boxes all over everything. The map has the actual map on the top and then some text directions and phone number for questions on the bottom fold. The registry card speaks for itself. Cute little logo and a website. Can't go wrong with that. :) Below, you will notice the complete package. This whole package falls neatly into a cute little arrangement. 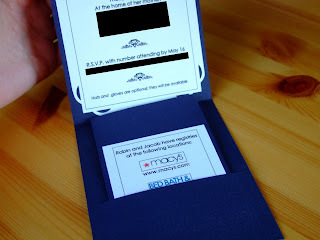 The two cards fit into the pocket on the bottom, that bottom parts folds up, and then the band with the monogram slips over the whole invite. Voila!